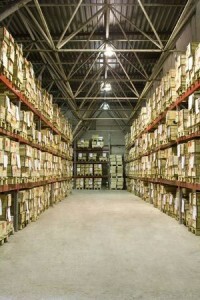 When it comes to your company’s warehouse, organization translates to money. That is, the less organized your warehouse is, the more time employees spend looking for an item; time is wasted. And, since time is money in business, your company loses money. The more organized a warehouse, the faster employees can find things, especially if they’re looking for items to ship to customers. The faster they find an item, the more than get ready to ship and the more time is saved…as well as more money made. An unorganized warehouse also can lead to more workplace injuries. Everything having a place and actually being in that place means far less clutter and hazards. Read below for five tips to help you organize your warehouse for maximum efficiency. 1. Take time to look over your warehouse’s organization regularly. It may have been organized a month ago or three months ago, but warehouses tend to become less organized as time goes on. Don’t assume that all is as it was when you organized it the last time. 2. Place your top sellers closer to your shipping/distribution area and make sure they’re easily accessible. This helps eliminate unnecessary searches by your employees. Make sure you research what products are your true top sellers. Don’t go with your gut: look at your sales data. 3. Place like items with like. Have 10 different types of armless office chairs in inventory? Make sure that when looking for items, your employees know that once they find one office chair, they’ve found your entire inventory. 5. Make sure your receiving and shipping departments have plenty of room to function. Time is lost – and mistakes often are made – when inventory workers have to work in a tight space. Room to move also means they’ll be less stressed when it comes to double-checking orders coming and those coming out, resulting in far fewer shipping and receiving mistakes.